Looking for the Best Maui Wedding Planners? Meet Lori and Jamie! We’d like to introduce ourselves. We are Jamie and Lori Lawrence, at your service! We are the proud owners and operators of Tropical Maui Weddings. We love weddings, and would love to help you with all of your wedding planning needs. We know what an incredible responsibility this is, and we’re honored that you have found your way here to our website. Jamie Lawrence was born in this beautiful paradise. He has been an entertainer on Maui for over 40 years, and has graced thousands of weddings with his magical voice. His romantic love songs will add that “special touch” to your wedding day. Aside from Jamie’s incredible music, he is also a talented helicopter pilot. He has whisked many couples away to remote Maui rainforest waterfalls to have their private ceremony in the beauty of Maui’s lush valleys. Lori (Scott) Lawrence was born and raised in Iowa. She worked as a school teacher for sixteen years for the Des Moines School District before moving to Maui in 2004. After following Jamie to several Maui weddings to hear him sing, and experiencing the excitement, she decided to dive into wedding planning herself (after all she is a Master Scuba Diver). Lori is truly a natural at making wedding dreams come true. 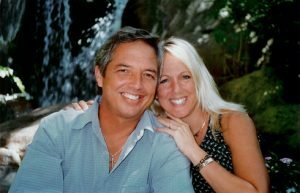 She has assisted hundreds of couples plan their Maui wedding, and has a very long list of extremely satisfied customers. She puts her heart and soul into each and every wedding, whether it is a wedding for 2 or 200. Every detail is carefully planned and everyone can tell that she truly loves what she does. Her primary goal is to keep every one of her wedding couples worry and stress free throughout the planning process, and especially on their wedding day! And she does it all with an amazing flair.